How EU Managed To Divert African Immigrants To Libya. Libyan-U.S backed militias stand on a boat with 147 detained migrants attempting to reach Europe off the coastal town of Zawiyah on 27 June 2017 AFP/. According to well placed sources and the information obtained from informants living among the immigrants, people testified that the western countries mainly Britain,France,Australia include United States and others have tasked a responsibility with their secretive organizations that established a covert link enabling some European countries channeling bribes to entities such as the militias that managing human traffickers and group of immigrant smugglers. The human slaves trade in Libya involves handlers as far as from the C.I.A, French DGSE and MOSSAD more respectively who are the "lords of the ring in human bartering activities in Libya's terrible events. The political anarchy and fragility prevailing in Libya makes once a stable and peaceful nations to became a nestling ground for secret organizations from all over the world. Some of these secretive entities that are operating in Libya have created ruses and recruited front covers and intermediate agents that also comprises same elements of the victims, who being tortured and usually enticed into such a trap. Desperate Asians and mostly African poor people mainly from western-eastern African regions are diverted from en-route to (Europe) back to Libya for mercenaries,free labor slavery and other racketeering business, where young woman being used in brothels of prostitution. In 30 November 2017 theguardian reported that Erik Prince, the founder of Blackwater an American private military company (mercenaries) founded in 1997 by former Navy SEAL officer Erik Prince. The company is now renamed as Academi following its scandal when Blackwater's mercenaries shot and killed 17 innocent Iraqi civilians and injuring other 20 people in Nisour Square, Baghdad in 2007. The owner of private military contractor who still has active tie with U.S military is the one again pushing a plan for Libyan mercenary, suggesting a proposal of privately trained mercenaries as police force in Libyan crisis. Understand that many European countries include once a friendly nations like Australia don't want immigrants any more to come into their countries [This's the reason there is a Brixit divorce from EU, because Britain don't want to accept European Union's monopoly of free movement between member states ] so, European nations engaged the informal second outfits to do dirty laundries on their behalf by funding human traffickers whose again employ their own unique structures comprises of greedy African kingpins from Nigeria,Ghana,Cameroon and etc to form a very confusing and complex mist that covered-up their inhumane activities. The Amnesty International also got evidence that European governments knowingly facilitate in complicit the torture and exploitation of thousands of migrants and refugees. 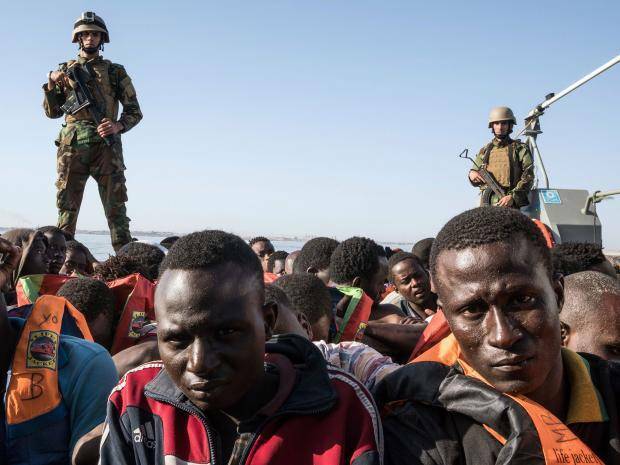 The EU-based nations financed Libyan coastguard and officials who running the country’s detention camps and rescuing African immigrants in Mediterranean sea. African migrants in Tripoli, Libya awaiting a transit to a detention centre for slaves. Following the provision of ships, training and funding from the EU and Italy to the Libyan coastguard, the number of arrivals to Italy fell by 67 per cent between July and November compared with the same period in 2016. Deaths at sea have been reduced commensurately. Yet Amnesty claims the coastguard and those to whom they hand over refugees, migrants and asylum seekers, are often acting in cahoots with criminal gangs and militia. One man from Gambia, who was detained for three months, told Amnesty how he was starved and beaten in a detention centre. “They beat me with a rubber hose because they want money to release me,” he said. “They call the family while beating [YOU]so the family send money.” After interviews with refugees, asylum seekers and migrants and meetings with Libyan officials and others with knowledge of the abuses, Amnesty claims it now has sufficient evidence to take leaders of EU states to international courts over alleged abuses of human right obligations. “European governments have not just been fully aware of these abuses; by actively supporting the Libyan authorities in stopping sea crossings and containing people in Libya, they are complicit in these crimes.” Up to 20,000 people are currently held in what the Amnesty report, Libya’s Dark Web of Collusion, says are overcrowded, unsanitary centres, often under the control of militia and criminals. “For some time there has been concern that the price for stemming migration has been the human rights of those seeking to come to the EU,” the report says. The UN human rights chief, Zeid Ra’ad Al Hussein, has described the suffering of migrants in Libyan camps as an “outrage to the conscience of humanity”. It is claimed by Amnesty that the EU member states “cannot plausibly claim to be unaware of the grave violations being committed by some of the detention officials and coastguard agents with whom they are so assiduously cooperating”. Last month Mohamed Alkoni, the Libyan charge d’affaires, said any proven allegation of slavery was “an act of an individual, and not a systematic practice”. However, this proven wrong because some state-actors in Europe quite aware the nature, but continue deliberately sponsoring human traffickers to divert refugees and immigrants from Europe's route who may just need humanitarian assistance from the repressive governments in other part of the world such as Africa, Asia and middle East.